Hoof care is an important aspect of sheep production and management. Hoof diseases can affect the health and welfare of sheep and have a negative effect on productivity. 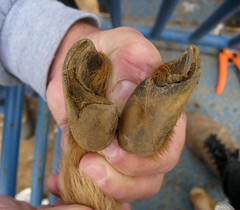 Hooves should be regularly checked for disease and excess growth. 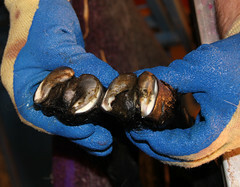 Animals which have excessive hoof growth, recurrent hoof problems and/or fail to respond to treatment should be culled. Hoof growth -- and thus, the need for hoof trimming -- is affected by many factors, including breed and genetics, soil moisture and characteristics, management and nutrition. Sheep grazed on rocky, dry soil may not require the extent of hoof care as sheep that are maintained on soil that is free of rocks and higher in moisture content. Sheep in high rainfall areas will need to have their hooves inspected more regularly than those on dry ground. Housed sheep usually require more hoof trimming than pastured animals. Sheep on a higher plane of nutrition usually require more frequent hoof trimming. Proper footrot or foot paring shears are essential to doing the job properly. 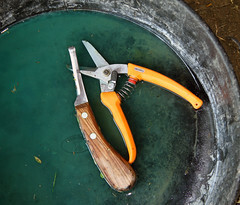 The ordinary, manual shears are not expensive and make the task so much easier. Air compressor driven shears are an option for people with large numbers of sheep. 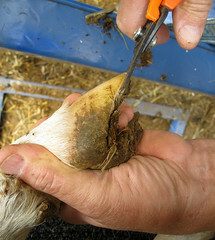 A sharp paring knife is needed to remove pockets and do a more thorough job of hoof trimming, especially when disease organisms are present. Foot trimming can be back-breaking work if there are a lot of sheeps feet to trim. 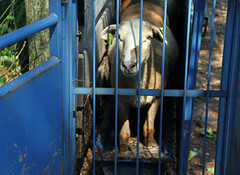 There are various types of sheep handling equipment that can restrain the sheep for easier access and trimming. A tilt or turn table will hold the sheep upright or on its side. There are manual and automatic (electric) tilt tables available. 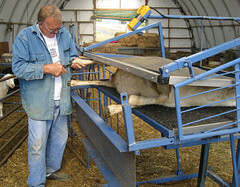 An elevated platform with a head gate can also restrain a sheep for hoof trimming, as well as other management tasks. A sheep or deck "chair" is a less expensive way to restrain a sheep for hoof trimming. When specialized equipment isn't available, the sheep is usually tipped onto its rump for hoof trimming. To trim the feet, securely hold the leg of the sheep. Inspect the hoof and remove any mud, manure, or small stones between the walls of the hoof. A rotten smell is usually indicative of foot rot. Clean all the junk and crud out of the hoof using a knife or the point of the shears. After cleaning the hoof, begin trimming around the perimeter of the hoof. Avoid cutting off large chunks of hoof. Stop at the first sign of pinkness. A pink color means you are getting close to the foot blood supply. The foot should be trimmed from the heel to the toe to remove excess growth of the "horny" portion of the hoof. To learn what a properly trimmed hoof look like, study the feet of a newborn lamb. Its hooves are flat on the bottom and have a boxy look. When trimming feet, avoid stressful times such as hot weather or late gestation. 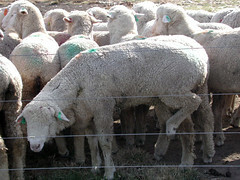 It's a good idea to combine hoof trimming with other management tasks, such as shearing or vaccinating. It will be easier to trim hooves that are soft from heavy dew or rain. Lameness should never be ignored. It can be a sign of several foot diseases  some of which are very serious  as well as some other problems. Foot lesions occur in some animals with bluetongue, a non-contatious, viral disease spread by biting insects. A red to brown band around the coronet is an important diagnostic sign of bluetongue. Foot abscesses are characterized by the swelling of the soft tissues immediately above the hoof and in advanced cases, draining abscesses in this area and between the toes. Foot abscesses are caused by bacterial infection of damaged foot tissue. The front feet are most commonly affected. Usually only one hoof is infected. Treatment is usually with anti-bacterial compounds. Foot and mouth disease is a highly contagious viral disease that affects pigs, cattle, sheep, goats, and deer. It is endemic in many parts of the world. Clinical signs of the disease in infected animals include blisters or ulcerations on the mouth, snout, tongue, gums, teats, or around the top of the feet. The signs of FMD in sheep and goats are usually much less obvious than in cattle or pigs. The United States has eradicated nine outbreaks of FMD, the last of which occurred in 1929. Since then, no cases have ever been reported in the United States. Canada has been free of foot-and-mouth disease since 1929. The United Kingdom experienced a foot-and-mouth disease outbreak in 2001. Foot rot is one of the worst diseases in the U.S. sheep industry. While footrot does not cause death, it may result in the premature culling of animals. Treatment costs, especially labor, can also be substantial. Footrot is a common reason for exiting the sheep business. Footrot is caused by a synergistic action of two anaerobic bacteria: Fusobacterium necrophorum and Bacterioides nodusus. 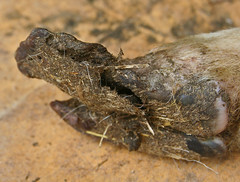 While F. Necrophorum is found in soil and manure and is present wherever there are sheep, goats, and cattle, the B. Nodusus organism usually "walks" onto the farm in the hooves of infected animals. There are over 20 strains of the B. Nodusus bacteria, varying in their infectivity and severity. Warmth, mud, and poor sanitation are the environmental conditions that favor the spread of foo trot, once the bacteria has been introduced to the farm. Warm, moist conditions create the anaerobic (lack of oxygen) conditions necessary for the spread of the disease. However, the B. Nodusus organism will only live in soil for 14 to 21 days. The bacteria that causes foot rot, Bacteriodes nodosus, is spread from infected sheep to the ground, manure, bedding, etc., where it is then picked up by noninfected sheep. Foot rot is introduced by purchase of an infected animal or by simply using facilities or trucks that have been contaminated by infected sheep. Spread occurs best when temperatures are from 40-70°F and the environment is wet. Since the organism doesn't survive long in the environment (< 2 wks), carriers in the flock will continue to reinfect the flock unless the animal is either culled or the organism is eliminated by proper treatment. Treatment of foot rot should be approached from a flock standpoint. Since the foot rot organism is anaerobic, the introduction of oxygen to its environment will help in eradicating it. Thus, it is important to keep sheep's hooves properly trimmed; although care must be taken not to cause bleeding. 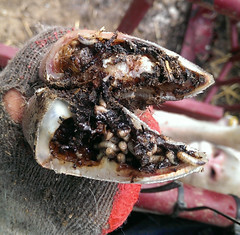 Elimination of overgrown hoof tissue will result in less mud and manure packing, which aids in environmental conditions conducive to footrot development. After foot trimming, the use of regular soaking in a footbath of a zinc sulfate solution (10% w/v) can greatly help in eradicating the disease. In the UK, aggressive hoof trimming is not recommended, as it is believed it may help to spread of the disease. Instead, it is recommended that antibiotic injections and antibiotic sprays be used to control foot rot and similar hoof diseases. European researchers have found success treating foot rot with Gamithromycin (Zactran®), a macrolide antibiotic that is licensed for cattle in the treatment and control of bovine respiratory disease. Vaccination of flocks with a history of footrot can help in prevention and in treatment of current cases. However, just because a sheep is vaccinated for footrot does not mean it is immune to infection. The vaccine does not cover all the strains of footrot. The vaccine is not always readily available. Producers with clean flocks can control footrot more economically by prevention rather than vaccination. Severely infected sheep that do not respond to treatment should be culled. There can be a genetic susceptibility to footrot; some sheep are more susceptible to footrot than others. Also, there can be breed differences in susceptibility to footrot. British and European breeds are less susceptible to footrot. Thus, sheep that have a resistance to footrot should be propagated, while, susceptible animals should be culled. Keeping records can help in identification of these types. Generally, black-pigmented hooves are hardier than white-colored hooves.It is much easier to prevent foot rot than to eradicate it. Several management practices help to minimize the chances that foot rot will establish itself in a flock. You should never buy sheep infected with foot rot. Avoid buying apparently clean sheep from an infected flock. Avoid buying sheep from sale barns where clean and infected sheep are penned together. Assume all new additions to your flock are infected with foot rot. Always isolate new animals for at least 30 days. Trim feet immediately upon arrival. Treat feet of new sheep following trimming. Re-inspect feet during the quarantine period. Foot scald is an infection of only F. necrophorum and is not contagious. 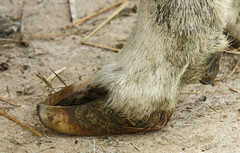 Foot scald causes lameness, frequently on the front feet, and lesions are found between the hooves. The tissue between the toes of a sheep with foot scald are generally blanched and white, or red and swollen. Foot scald is much easier to treat than foot rot. Many times, placing sheep on drier footing and out of mud will alleviate the problems of the disease. Foot scald may also be treated topically by applying a solution of copper sulfate (Kopertox). The simplest and most effective treatment is use of a footbath containing 10% zinc sulfate solution (8 pounds zinc sulfate to 10 gallons water). The frequency and severity of foot scald infection will decline as drier weather returns. Lameness related to laminitis is caused by inadequate blood flow in the hoof caused by digestive problems resulting from the excessive intake of grain (grain overload, acidosis). Animals often die before the feet become involved. Recovered animals may exhibit unusual foot growth and/or permanent lameness. Lameness caused by soremouth is the result of blisters appearing on the skin near the top of the hoof wall. 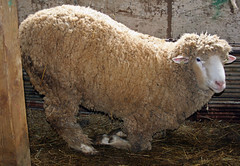 Simultaneous blisters appear on the mouth and other areas of the sheep's body. The infection is more common around the mouth than on the legs or feet. Lesions can be treated with an ointment containing a broad spectrum antibiotic. Soremouth can be prevented with vaccination. Late updated 28-Aug-2016 by Susan Schoenian.